About the reviewer: Alan O’Leary is Professor of Film and Cultural Studies at the University of Leeds. He teaches cinema, history, cultural studies and translation at undergraduate and graduate levels, and received a Faculty of Arts Teaching Prize for designing a film studies pathway through the Italian degree. Alan has contributed to publications such as Screening European Heritage: Creating and Consuming History on Film (Basingstoke: Palgrave Macmillan, 2016) and Italian Political Cinema: Public Life. Imaginary, and Identity in Contemporary Italian Film (Oxford/Bern: Peter Lang, 2016). The Battle of Algiers (Gillo Pontecorvo, 1966) had its controversial premiere at the Venice Film Festival in September 1966, and its half-century has been the occasion for several reconsiderations of the film, among which is this celebratory short book by Sohail Daulatzai. Scripted and made by Italians, the film was commissioned by the Algerians themselves to hymn their independence from France in 1962. The historical battle of Algiers (1956-7) referred to in the title was a relatively minor affair in the overall achievement of Algerian liberation but the film’s powerful vision of a city divided means that the struggle in Algiers has come to stand for anti-colonial movements and anti-imperialist sentiment, remote in space and time from the events it depicts. Daulatzai himself goes further, suggesting in the opening words of the book that ‘the Battle of Algiers is still being waged, only now on a planetary scale’. 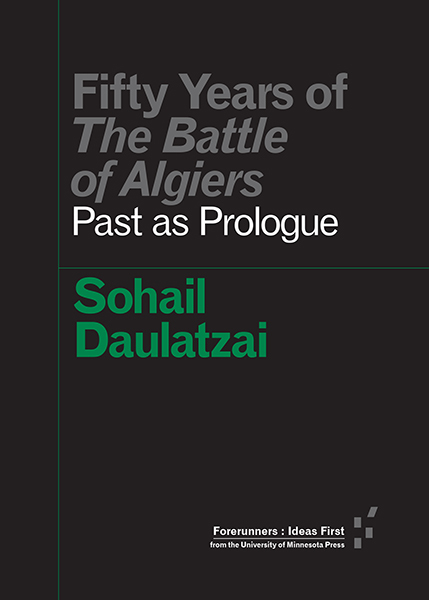 Daulatzai’s book is in part a brisk account of the status, reception and exploitation of The Battle of Algiers since its release. He describes how the film has been perceived as a kind of catechism by some revolutionary groups (and the book reprises this quasi-religious approach to the film) but has also been used by states to teach techniques of counter-insurgency and torture. Overall, though, Fifty Years of The Battle of Algiers is not really a book about the film, but one that employs it to motivate a popular history of anti-imperialist thought and activity since the World War II. The author talks of how the routes travelled by The Battle of Algiers as a ‘nomadic’ film ‘reveal a larger story about how freedom dreams were shared’. Like very many writers, Daulatzai asserts the perennial ‘relevance’ of the film and believes that the film ‘helps to reveal the continuities between the era of decolonization and the present’. The film is used to articulate the book’s key theme and argument: that the so-called war on terror is ‘another chapter in an on going campaign of counter-insurgency against the Global South’ and that decolonization is therefore an unfinished project. Daulatzai dwells in the course of the book on topics like Third Worldism (an ideology and alliance of former colonized countries), the influence of the anti-colonial writings of Frantz Fanon and the importance of Algeria itself as a revolutionary mecca after its liberation. He presents The Battle of Algiers as a foundational text of ‘Third Cinema’, meaning a revolutionary cinema distinct both from the dominant Hollywood cinema associated with imperialism, and from the supposedly politically disengaged ‘second’ cinema of the European auteurs. 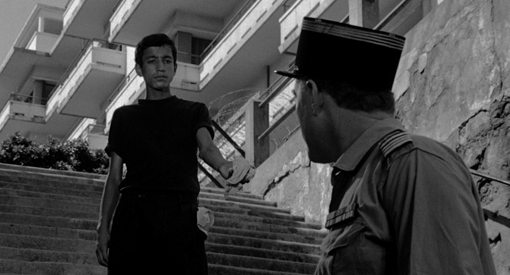 The Battle of Algiers, he argues, shares the Third Cinema project of turning ‘viewers into active spectators who would become witnesses and, ultimately, rebels’. Islamophobia in the post-9-11 context is a key concern throughout Fifty Years of The Battle of Algiers (the book is written from an American perspective, but too soon to mention Trump), and so Daulatzai commends the sympathetic vision of Islam in the film and its challenge to colonial and Orientalist representations of the Muslim that still thrive, alas, in the present day. The book relies on fine scholarship by writers like David Forgacs and Thomas Riegler for accounts of the production history and afterlives of The Battle of Algiers but the its few descriptions of the film itself are rather generic or imprecise, and the celebratory tone tends to oversimplify. For example, and contrary to how it is presented here, The Battle of Algiers has a very ambiguous and even negative status in discussions of Third Cinema, and a strand of left-wing criticism dating from its release condemns the film for its use of action movie and gangster tropes and for what is felt to be a mystification of the revolutionary process. Still, the book does contain several intriguing suggestions, for example that The Battle of Algiers ‘continues to haunt the imperial consensus, an enduring reminder of a freedom dream not yet achieved’ – hence the notorious projection of the film at the Pentagon in 2003. Intentionally or not, Daulatzai reveals something essential about political cinema that is often disavowed. Political cinema is typically discussed in terms of its didactic aspect – how it helps us to analyse an exploitative situation or to recognise the oppressive conditions of other’s lives (or our own). However, political cinema also has a ritual function. Watching a political film is like communal worship in a Mosque or Church: it is the occasion for the expression of shared values and beliefs and the opportunity for fellow feeling with those who share those values and beliefs. Perhaps the key purpose of political cinema is to provide its audiences with a sense of themselves as a constituency, that is, as a group with a political identity held in common. Fifty Years of The Battle of Algiers celebrates a text in the attempt to cement such a constituency and Daulatzai’s book is best read, not as an analysis of The Battle of Algiers or its legacy, but as another moment in the history of the reception of the film.